We completed a refurbishment of lounge and outdoor furniture in July 2018. Our apartment is 150 metres from the nearest ski lift, and 100 metres from the nearest piste. It is central to the village, but in a quiet area. The large terrace is fully enclosed to waist height, and is ideal for small children in summer. There is a connected balcony, with a gate from the terrace. The apartment has been independently audited for child safety, and a full range of baby and toddler equipment is provided. There is easy access to all Chamonix valley ski areas, Megeve, St. Gervais, Les Contamines, Flaine, Courmayeur, Aosta Valley, etc. The apartment is finished to a very high standard and comprehensively equipped. Sleeps up to 8 in bedrooms (one double, one twin/double, one room with twin bunk, single, and pullout single). We recommend a maximum of 9, but can take up to 11. The lounge has a convertible double sofa/bed, and a second sofa is a full size single. Bed linen included in price. Cleaning and maintenance by English-speaking local agents. There is a secure, allocated, underground parking space. Bookings and Payment: We accept bookings for any period (minimum fee 4 nights). We welcome enquiries for seasonal and long-term rental - please contact us as early as possible to discuss you requirements. Deposit of £50 or equivalent at time of booking, the balance due 8 weeks before arrival. Payment via Homeaway payments using credit card. english, Limited French. My wife has some Spanish! I've been a keen skier for many years, and was looking for a place that had year-round appeal and good access to other ski areas and holiday attractions. The Chamonix valley hits the spot, and has some of the best scenery in the Alps. We looked at a number in the Valley. Chamonix town is a lot more expensive, and can be noisy. This apartment had the unusual benefit of a large terrace, and also unusually for a place of this size is all on one level. Chamonix and Les Houches are the antithesis of the purpose built ski resort. They are real communities, with a hugely mixed population (English stand-up comedy in one pub!). Businesses are individually owned and know they are competing for your custom. So it's friendly and dynamic. Skiing is not even the biggest sport - that's climbing. But the skiing is world-class. However, don't be put off by the Chamonix reputation for tough stuff: there's something for everyone! Bed linen and towels are provided by our local agent. Single allocated space in secure underground garage. The large, solidly-fenced terrace, raised one level from the building entrance, is fully decked and ideal for toddlers in the Summer. It does not get too much direct sun, so small ones can play safely while adults use the apartment and separate balcony. The master bedroom has french doors opening onto the terrace, so tired parents can watch over the little ones from their bed! Child safety has been independently audited, and the apartment is equipped with relevant safety features for young children, and also has baby/toddler equipment such as high chairs, cot/playpen, steriliser, bed guard, etc. Staying as a family, we found the apartment very child friendly with plenty of indoor and outdoor space. Good value and conveniently within walking distance of shops, bus stops and lifts. The nearby bakery is excellent. Although the onsite ski locker is a generous size, it struggled to accommodate skis/sticks/boots for 6 of us, so another time we would check out ski hire shops with lockers. There is an ongoing problem with the locker as guests tend to leave broken plastic toboggans in there, and it slowly fills up--. I would never leave boots in there: they will be cold and damp in the morning! Take them off, carry them upstairs and leave in the apartment lobby. Most of the local hire shops will also store equipment rented from them, and private equipment for a small fee. Best location in Les Houches, briliant view of Mont Blanc from the largest balcony!! Host was quick to provide all information required. The flat is situated in a quiet residential area and is perfectly suited for families with young children. Location is short walking distance to local supermarket, bus station and a couple of excellent restaurants. We will be back! Many thanks! We enjoy to apartment and the location very much. I am afraid we were not happy with the way you left the apartment. One new cushion was badly stained and may need to be replaced. Some bed linen was left behind the water tank, and in general the place was not left in a good condition, so extra cleaning was required. Just left after 6 days staying in the apartment in les Houches. Great appartmet and really well equipped, spacious, beautiful views and only 2 minute walk to the nearest ski lift or bus stop. Really enjoyed skiing in the local area with the family, also took the excellent bus service to brevant and skied there too. Chamonix lovely to go out in evening and for shopping. Particularly enjoyed the kitsch inn in les Houches, great atmosphere there. We have had a great time and would totally recommend this accomodation. Thanks, glad you had a good time. The snow has been brilliant this winter! We like the Kitsch Inn as well - in fact my stepson worked there this winter. overall we loved it - spacious, straight forward, good equipment, good location, stunning views, lovely deck. Excellent manual! Les Houches is at the entry to the Chamonix Valley, with its own ski area. 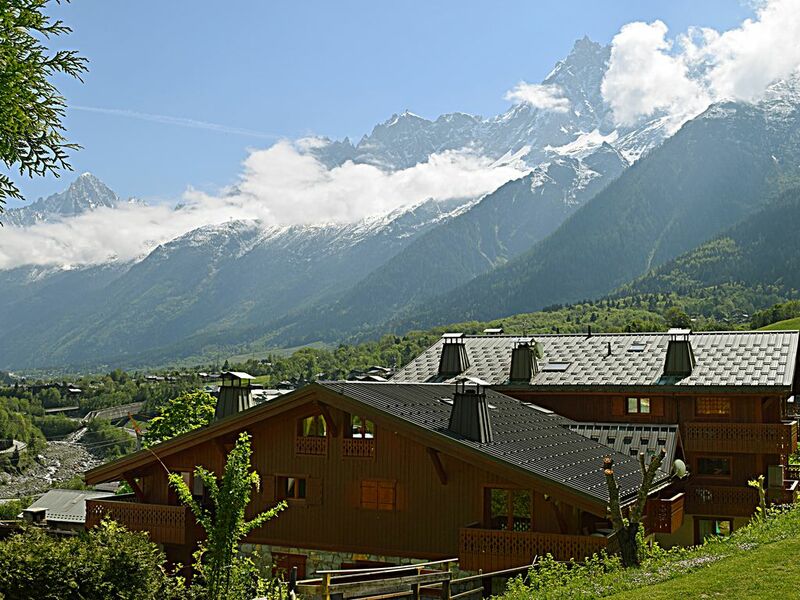 A quiet village a few km from Chamonix town, with easy access to all local and area facilities. Other Activities: Climbing, rafting, canyoning, paragliding, walking, forest adventure parks, good shopping. Ski: The Chamonix Valley is world-famous for its variety and range of skiing, but it is emphatically NOT a linked, purpose built, ski system. Access to other resorts in the area is very easy. There is a huge range of options, and plenty to suit skiers of all abilities. Snow is sure, as the highest pistes start at over 3000m. Any stay duration is fine subject to a 4 day minimum, any arrival and departure date. Because of an increase of short bookings and some recent problems with extreme cleaning requirements I am now taking a £100 end of stay cleaning fee.